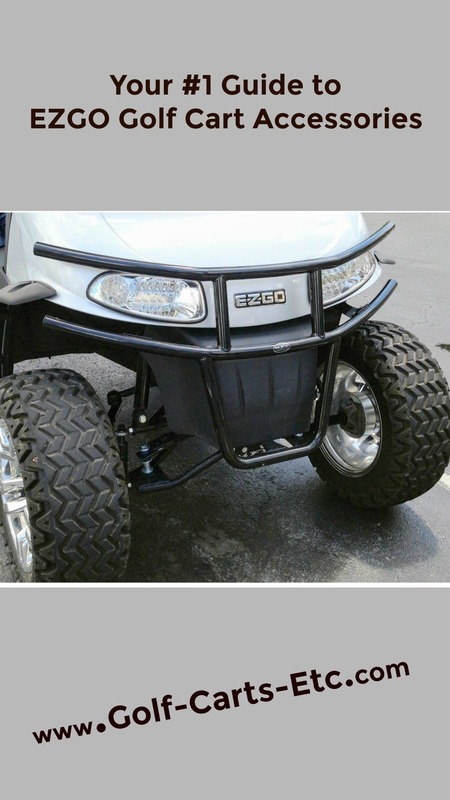 EZGO golf cart accessories can be EZ GO specific to the make and model of your cart or a general accessory that fits any type of golf cart. 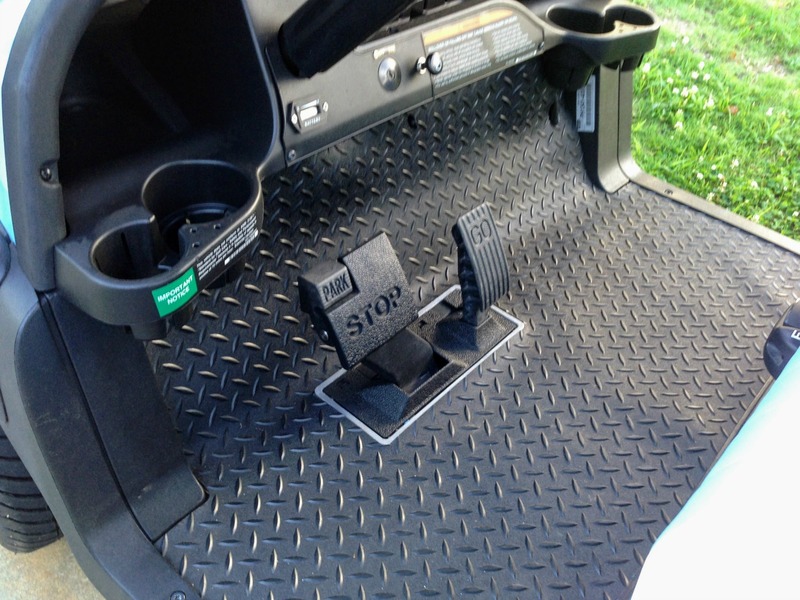 Where do you find EZGO golf cart accessories? Even though I live in a golf cart community with lots of golf cart dealers, I still find that the on-line stores offer more variety and selection for purchasing many of the smaller accessories like mirrors, lights and even rear seats. And surprisingly I've had lots of good experiences with helpful customer service, if I need help with my selection. I purchase most of my golf cart parts & accessories from Amazon. 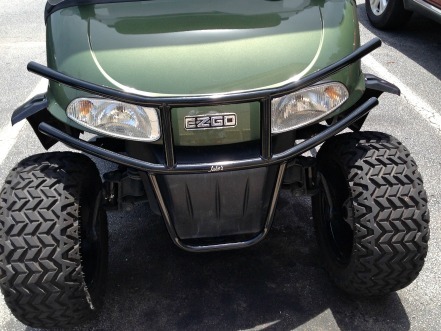 They offer a variety of suppliers for all of the EZGO golf cart makes and models. Golf carts that come from golf courses that have retired their fleet of carts have no lights - no headlights and no tail lights. These can be added by purchasing golf cart light kits and by having your golf cart dealer install them or you can do it yourself. 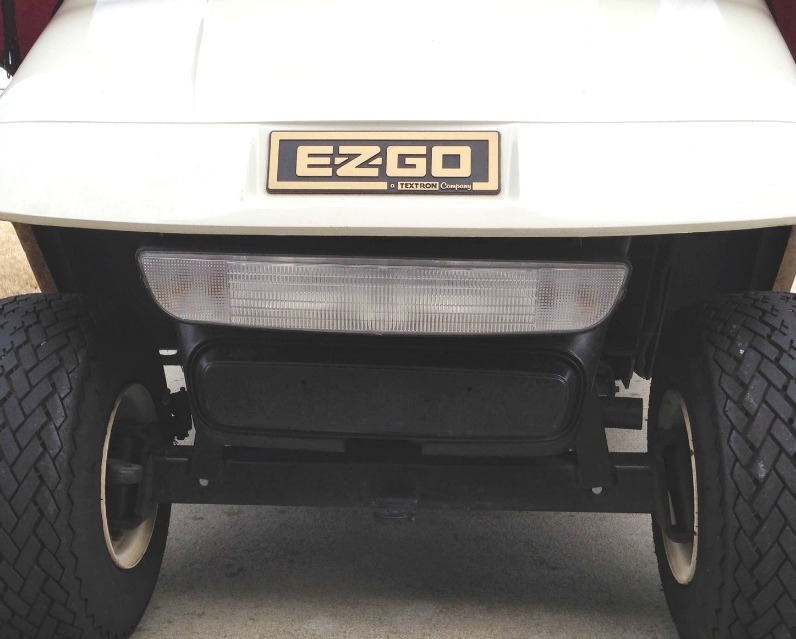 What makes an EZ Go golf cart stand out from other golf carts is their front cowl design with built in headlights like the one pictured above. Golf cart light kits are specific to the make and model of your golf cart unless you buy a universal light that mounts below your front body cowl. There is also another light kit for EZ Go golf carts that doesn't require any cutting of the front cowl. It is a headlight bar for 1996 & Up EZGO TXT Models. 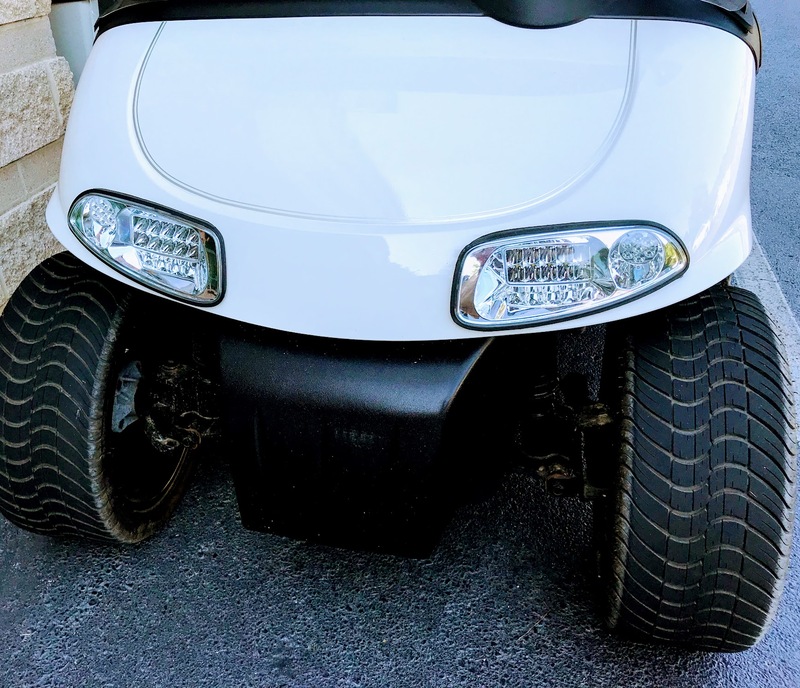 This EZGO TXT and Medalist light kit for electric EZGO golf carts includes 2 LED tail lights, one halogen headlight bar, wire harness and on/off switch. 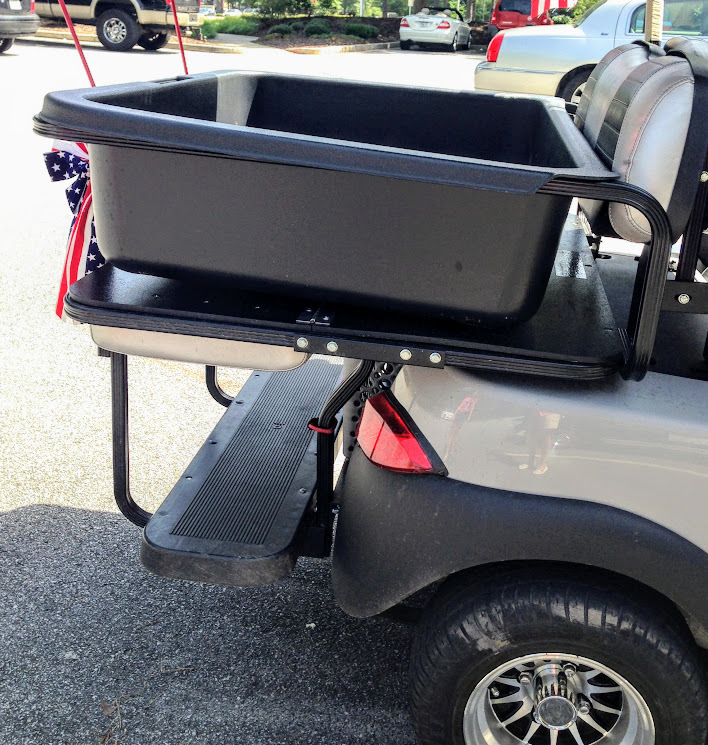 The Cargo Caddie works on carts that have a rear fold down seat. Simply fold down the seat and attach the straps to secure it. Use the Caddie to carry groceries, plants, or soccer gear. Just hose it off to clean it. This lightweight (weighs 8.5 lbs) cargo box fits perfectly on your flip down seat or on the golf cart roof. The size of the cargo box is 40"x30"x9" and is made of ABS plastic. A rear cargo box of black powder coated steel can find lots of good uses. This one measures 30" long and 43' wide and comes with mounting brackets. This custom EZ Go golf cart steering wheel kit includes the steering wheel, RXV hub adapters and a stainless steel steering column cover. It' made to fit EZGO RXV golf carts from 2007 to present (will not work on TXT or other EZGo models). The column cover installs by simply slipping it over your factor steering column. 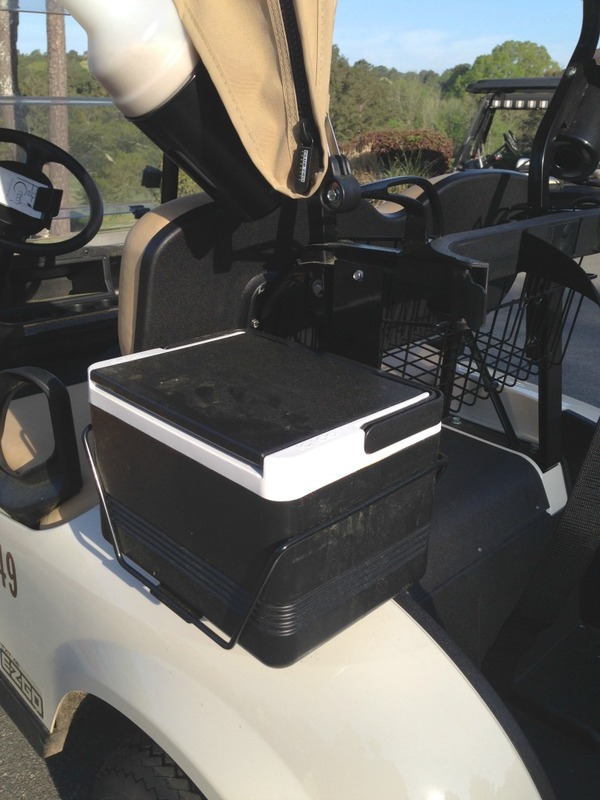 This golf cart cooler bolts to the fender and works with EZ-Go TXT, Medalist or RXV golf car. The cooler keeps 6 canned or bottled (if laid down) beers cold. 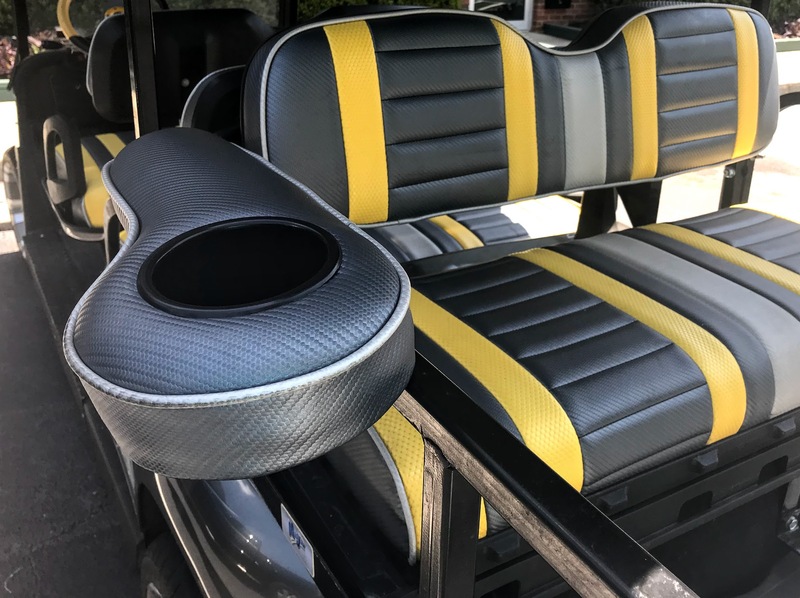 New golf cart seat covers can give an old cart a whole new look. Our 1987 golf cart seat cover has finally started developing a few tears. Fortunately there are several ways to make the seats look like new. There are lots of fabrics to choose from as well as colors and color schemes - so deciding on the color is not the only choice you have to make. New vinyl covers can be stapled on or fleece or Sunbrella golf cart seat covers can be simply placed over the old ones. Lots of elastic means you get a tight fit just like the bottom sheets on your bed. 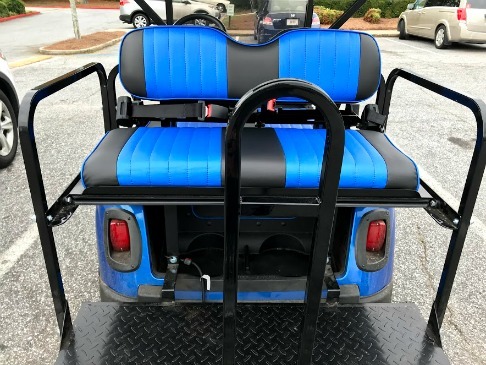 Did you know that you can add a golf cart rear seat if you want a 4 seat golf cart? Some golf cart rear sits are called a Flip seat set. The rear facing seat can flip down and can be used as a utility bed for hauling stuff or for doing yard work. We've used our flip down back seat for hauling mulch, plants from the store, or just to carry big items. The seat colors for EZ Go golf carts come in tan, white or black. A kit runs between $250-$300. It is recommended that you install heavy-duty rear leaf spring kit for rear suspension support. Your rear seat passengers will appreciate having their own custom arm rest and beverage holder. Golf cart wheels and tires come in many different styles and sizes. 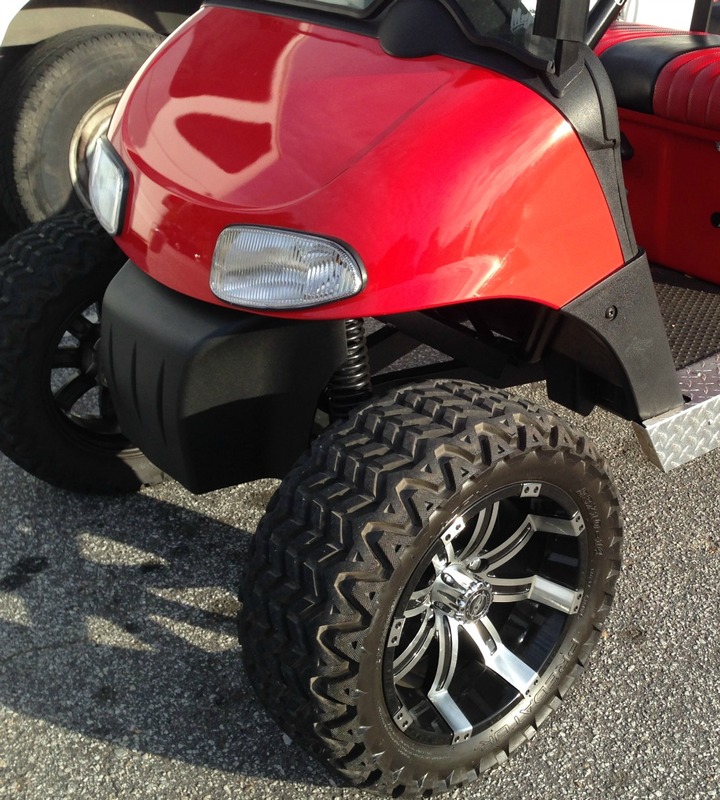 Custom golf cart wheels like the one in the picture give a true custom look to your golf cart. Constructed of either aluminum or steel, the only thing standard on the many styles of wheels are the 4 lugs. If you buy the wheels and tires as a set, you can save more money. That's what I did with my golf cart. You don't want to get cheap tires that wear out quickly and then have to re-mount your custom wheels. 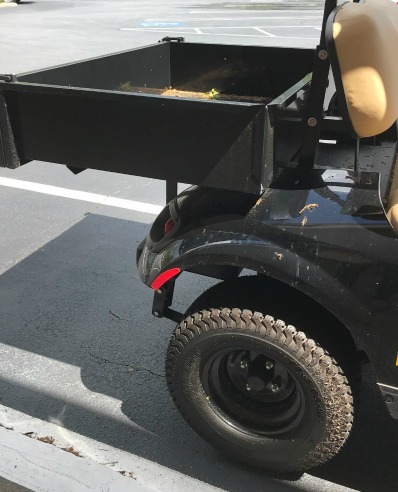 The type of wheels and tires you buy depends on whether you use your golf cart on golf courses or off road and if your golf cart is lifted or not. 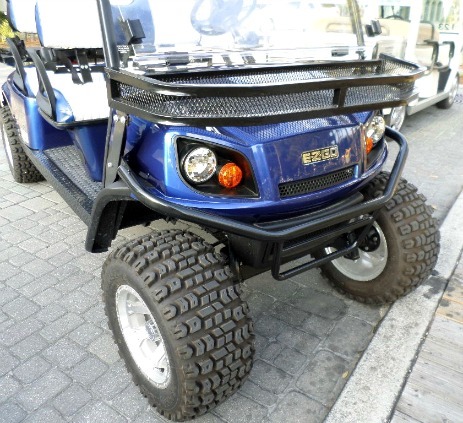 Tires and wheels are not specific to a golf cart make, model or year. Some tire treads are not allowed on golf courses, while other treads are suitable for hunting or off-road use. The most common sizes for golf cart tires are between 8" to 12". 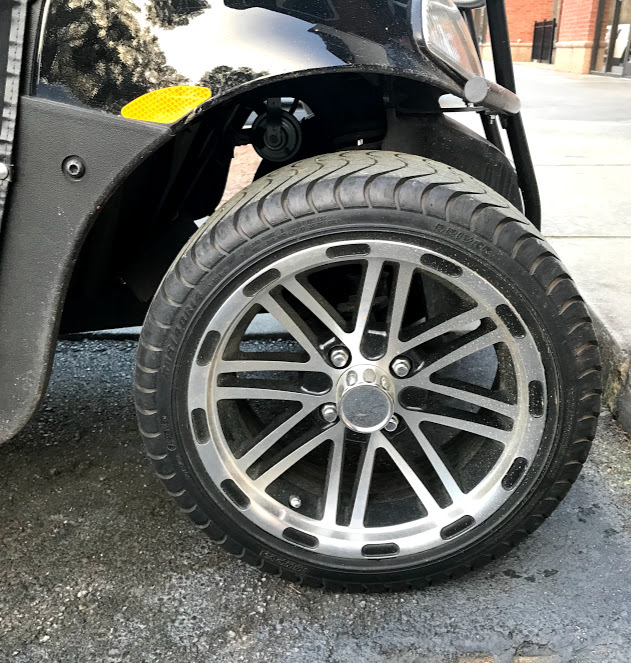 A set of low profile golf cart tires and wheels allows a larger tire and wheel to be installed without the need for a lift kit. This 12" tire combo tire and wheel set comes with the tires mounted. 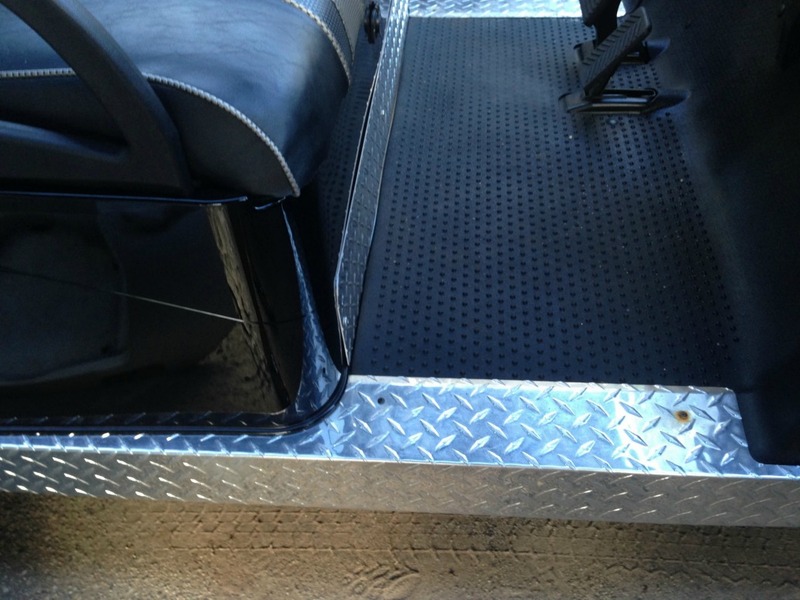 Rubber golf cart floor mats add a custom look with this diamond plate design. These mats are pre-cut so you need to be sure you get the one specific to your golf cart make and model. 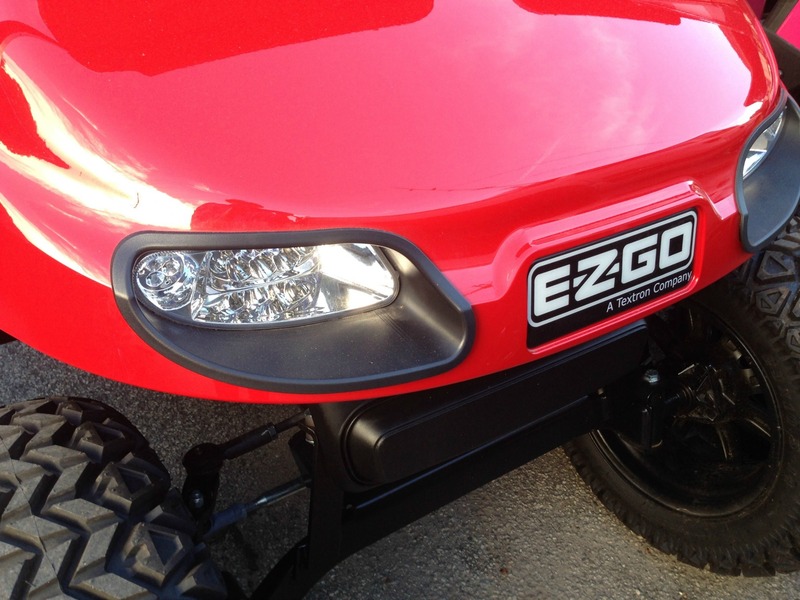 Check out this picture of how a diamond plate rocker panel can customize your EZGO golf cart. You can get the "shiny" version or a black diamond plate. They are easy to install and most kits include all of the hardware. You may have to shave a little off for a perfect fit. 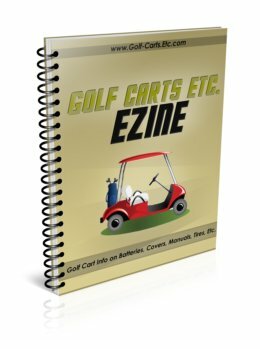 I've been looking at used EZ Go golf carts. The last one I looked at had a big crack across the windshield. So of course the windshield needs to be replaced. 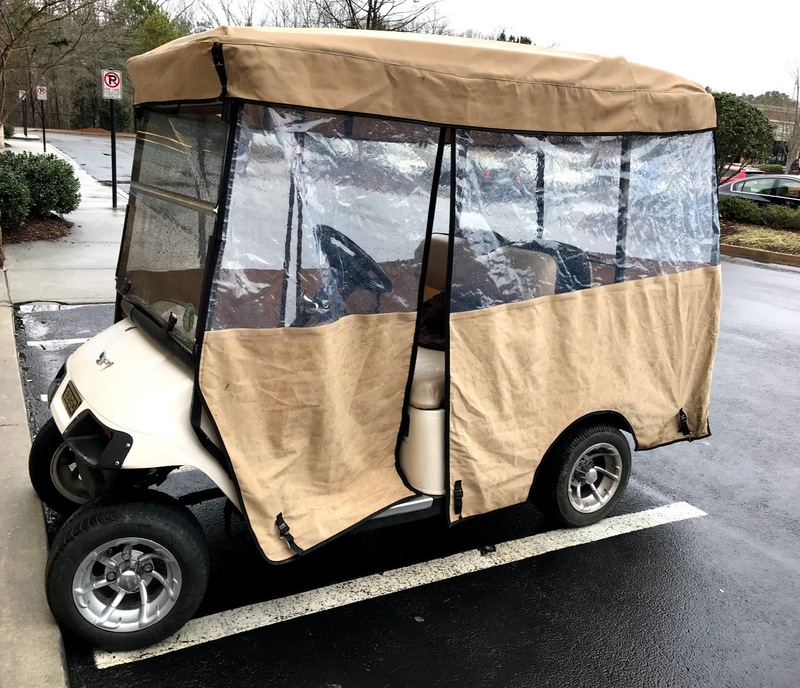 This is an easy fix and an important golf cart accessory to help keep you dry and warm on cold, rainy days or nice and cool on hot days - that is if you choose a fold down windshield. 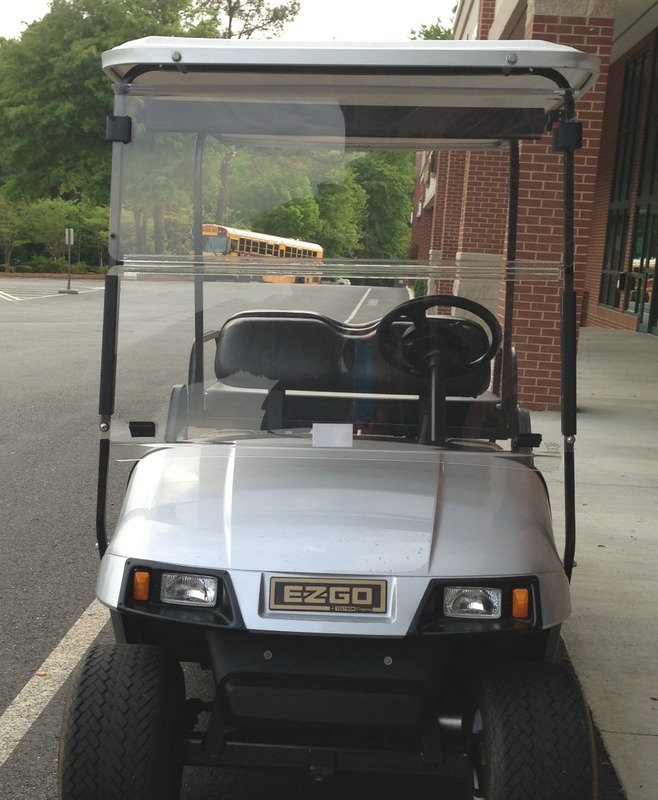 A golf cart enclosure makes it possible to use your EZ Go golf cart for more months out of the year. It protects you from the wind and rain and helps to keep you warm even in colder months - often without a heater. An enclosure can be either specific to your golf cart make and model or for a better price, get a universal enclosure based on whether it is a 2, 4 or 6 passenger cart. My recommendation is to get one made out of long lasting outdoor fabric that does not fade - Sunbrella fabric. I also prefer an enclosure that fits over the roof. Just roll up the sides when it is warm out and leave the enclosure on year round. Or you can choose a custom look and feel using Sunbrella fabric that doesn't fade, stain or mildew. 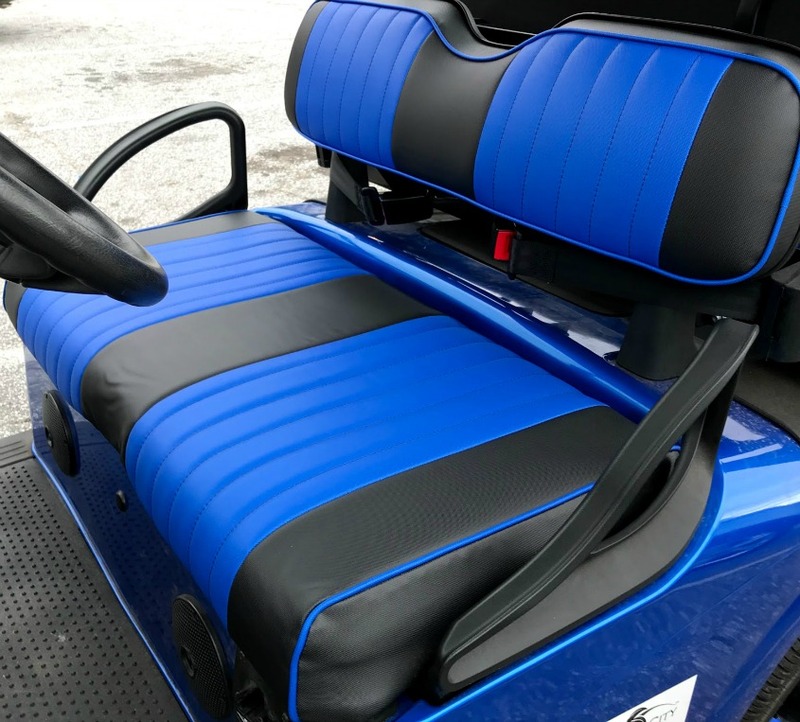 You can choose solid colors or stripes for an enclosure that is specific to your EZGo golf cart make, model and year for a custom fit. Looking for some extra storage or hauling capability for your golf cart at the lake or in the woods? A front clay basket made of durable steel is functional and also provides a rugged look especially combined with a brush guard. For those of you who don't have the space to store your golf cart in the garage, golf cart storage covers offer the perfect solution. These are often bought as a universal storage cover rather than as a custom cover. The size is based on how long your golf cart top is and how many passengers it seats. Golf cart storage covers protect your cart from the damaging effects of rain and sunlight. So whether you want a cover to keep your cart dry for an overnight camping trip or putting it away for the winter months this small investment can protect your golf cart seats from staining and getting moldy and damaging the paint job of your golf cart body. 2. Double top stitching adds durability. 3. Front and rear vents prevent condensation and lofting. 4. Rear zipper allows access to cart without removing cover. 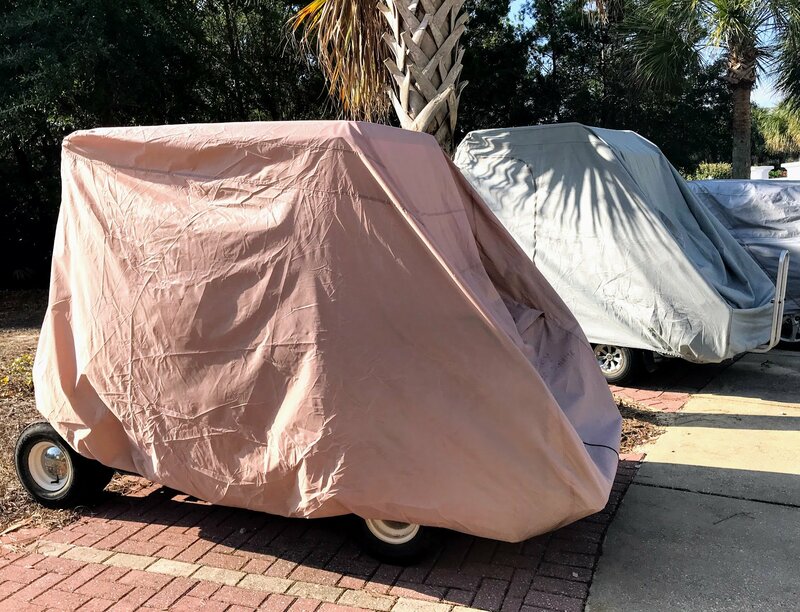 Most golf cart storage covers are universal meaning that the make and model of the golf cart is not as important as the size of the golf cart. For less than $40 you can protect your EZ Go golf cart from rain, dirt and wind. Customize with accessories like brush guards, fender flares, or diamond plate rocker panels. 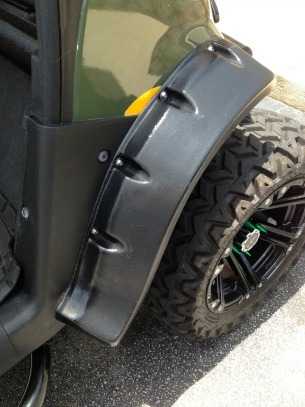 Give your cart a rugged look with a Jake's Brush Guard, a well known and respected manufacturer for this custom golf cart part. If you happen to be on the golf cart paths in Peachtree City when the high school is getting out, you will hear lots of golf cart radios blaring, oh I mean in use. Because this golf cart accessory is built to be water resistant you don't need to worry if you get caught in the rain. The two main styles are an overhead radio or in the dash console. They run around $200 and can by found on line at Buggies Unlimited. You can purchase the radio as a kit which saves money and time. 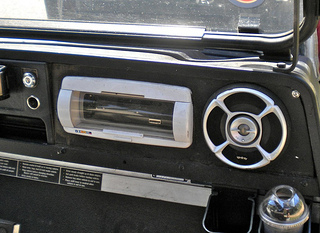 If you want a custom look consider getting a new dash to fit the radio and speakers like the one pictured. 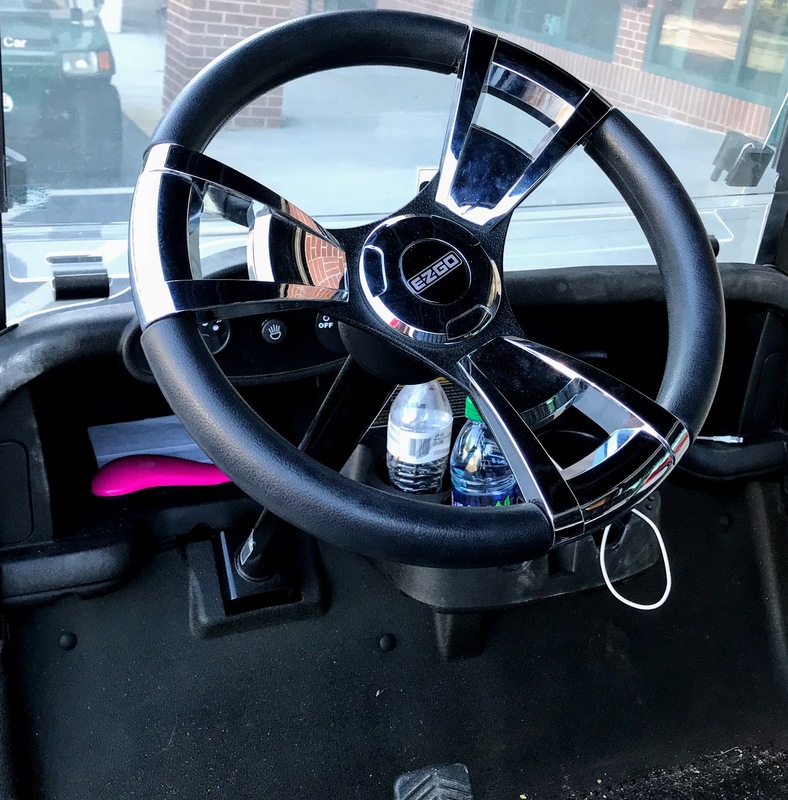 EZGo golf cart accessories serve to provide comfort such as in a golf cart heater, enjoyment as in a MP3 player, function as in a storage unit or style such as a new piece of shiny trim.